Flying to Africa is expensive. 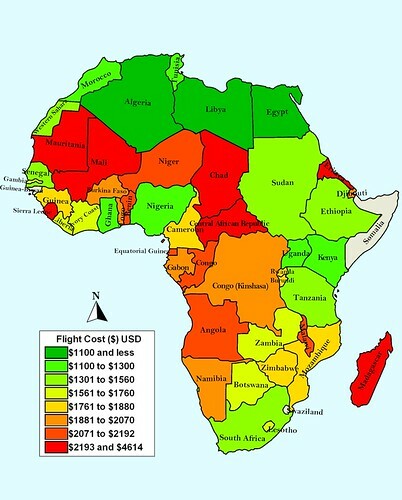 But where are the least expensive places to fly in the continent? As I search for the location of my next adventure I decided to check on the cost of flights in a given week from Detroit to all the African capitals to see if there was anything fascinating and worth mentioning. There certainly are some surprises; It also provides some information for people looking at the relative cost of travel to various African states. Ever since I discovered kayak.com I've been doing numerous searches for deals on flights to Africa. (I use the term "deal" very loosely). After hundreds of searches I've learned a few things I thought I'd share with you. 1. Prices to Africa fluctuate significantly. I've seen prices go up and down well over $1,000 per week. 2. In general, buying tickets around 5 months in advance provides the lowest average price. 3. Thursday departures from the US seem to result in the lowest fares. My default, first search is a Thursday US departure and a following Saturday departure from my destination. In my Kayak account I use the three days before and after for both, but that never seems to make it much cheaper. 5. Set alerts from kayak.com on your travel dates to keep track of the price movement. Also, use their calendar to see fluctuations in best price fares at different times of the upcoming year and in months past. Keep in mind this isn't always possible since there aren't a whole lot of inquiries into flight pairings such as Detroit to Luanda. For this project I picked November 4 and November 11 as travel dates from and to Detroit Metro Airport (DTW). I used kayak's flexible schedule with three days before and after, but as I said, this doesn't seem to alter prices noticeably. I find it fascinating that the most inexpensive countries to travel to border the most expensive. Further, the fact that Libya's Tripoli was the lowest at $1,059 is interesting in itself. The surprise on the expensive side has to be Mauritania. With the exception of Rabat in Morocco and Laayoune (which I used in place of a Capital for Western Sahara) Nouakchott is the closest destination for most of the US. However, Mauritania comes in at 6th highest with round trip airfare costing 2,337. Notably, Mauritania comes in right in front of Madagascar (2371) despite the nearly 5,000 additional miles needed to fly to Antananarivo. I've included all the results at the bottom of this post. Does anything unexpected jump out at you? Have you had any great flight deals?